Physicians Committee is very excited to be able to share with you another victory for animals. 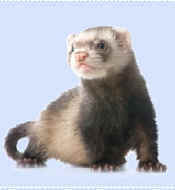 The University of Washington (UW) Seattle informed us this week that it has replaced the use of ferrets with human-based medical simulators to teach future pediatricians. This change is the result of PCRM's campaign, the support of our members, the hard work of the local advocacy group Seattle Animal Defense League, Northwest Animal Rights Network, Action for Animals and the willingness of UW to adopt current best practices. We could not have done this without you, who, along with 59,000 PCRM supporters flooded UW administrators with e-mails and written petitions over the past year encouraging the school to take this progressive step. And UW finally listened! A UW spokesperson informed PCRM that instead of ferrets "tetherless simulators are being employed at the point-of-care at the bedside to simulate resuscitations and enhance teamwork among healthcare providers." The spokesperson also stated that "simulation will be a more cost-effective way to train intubation techniques." Ferrets used in endotracheal intubation training at UW suffered through multiple intubations and were used for several sessions. Also, some of the animals used were later killed. Fortunately, the school has now joined the 95 percent of pediatrics residency programs in the United States that view nonanimal methods as not only more humane but educationally superior.